The Tyrrhenian Admiralty had spent the previous ten years of the 'battleship holiday' squirreling away money for the day when it could lay down some new capital ships. 1932 and all the treaties become null and void as Japan fails to sign. Everybody lays down new ships at the 35,000 ton / 16" limit with the proviso that if Japan has still not signed by 1935 that the limit would go out to 45,000 / 16" limit. That was not really good news for the Tyrrhenian Navy as the biggest guns mounted on their ships were the 14" supplied from the US. The biggest guns their own armouries had built were 12" weapons dating from 1903. When the Tyrrhenian spies looked around at what the other European powers were doing they found that all were laying down 15" armed battleships for their first units. What to do. To upgrade and put into production 14"/15"/16" weapons, would be very expensive, but the Tyrrhenian Navy would then be guaranteed a supply of weapons' of whatever calibre chosen, thereafter. Otherwise the only other choice was to purchase 'off the shelf' weapons from an overseas source. Enquiries were sent to the US for quotes on 14" and 16" weapons. The types requested were not the very latest but the types that had armed the Tennessee and Colorado classes. The next problem was what sort of design should be undertaken. The last Tyrrhenian battleship class was the Majorca armed with 12x14" and was almost 35,000 tons to start. To improve that ship and keep at least 28 knots of speed would require a slightly longer hull, and better armour. An armament of 12x14" or 8x16" would be the minimum required. What the Tyrrhenian designers found (as did most other navies) that a balanced design on 35,000 tons with decent speed, armour and armament was almost impossible to design. Most countries just lied outright about the size of their initial designs. The Tyrrhenian Navy went for a 37,500 to 38,000 ton ship and ordered eight twin turrets with 16" guns. A seperate order for four more twin 16" was placed a year later for the TNS Tyrrhenia that would be due to be laid down in 1935. The two ship Cyprus Class was ordered and laid down in 1933, on confirmation that the US would supply 12 twin 16" turrets and guns in 1936/37. The US supplied all the details for the barbettes and handling gear which Tyrrhenia would have to manufacture itself. The secondary armament would be the newly tested twin 5.1" dual purpose weapon of which ten twin turrets would be fitted. The license built 2 pounder weapons in quad and octuple mountings would form the tertiary armament. A few early 20mm were designed in, but by the time the ships were nearing completion the number of 20mm just grew and grew. The Minorca received a torpedo hit and the Cyprus bomb hits from the Commonwealth air attack on the base at Palma. Both ships were at Syracuse when Tyrrhenia surrendered, Cyprus was ceded to France, Minorca to the USA. The Cyprus was used by France till the Jean Bart was fully complete in 1955, then the Cyprus was reduced to a training ship until 1960 when the ship was stricken from the list of active units and sold for scrap. The Minorca went to Hawaii where the ship was used for tests (as the target) with various new weapons, then expended at the Bikini Atoll nuclear tests. The original 16"/45 (40.6 cm) Mark 1 weapons were built for the three ships of the Colorado Class. The mark V weapon built for the Cyprus class was also retroactively fitted to the Colorado's during the later 1930's. The major difference from the Mark 1 gun was the redesign of the chamber to permit larger charges, a new liner with heavier taper carbon steel, liner-locking ring and locking collar. The turret was redesigned to enhance the range of the guns. These guns could not fire the "super-heavy" 2,700 pound (1,224.7 kg) AP Mark 8 projectile, as that shell was too heavy and too long for their handling equipment. However, the Cyprus Class were given the 2,240 lbs. 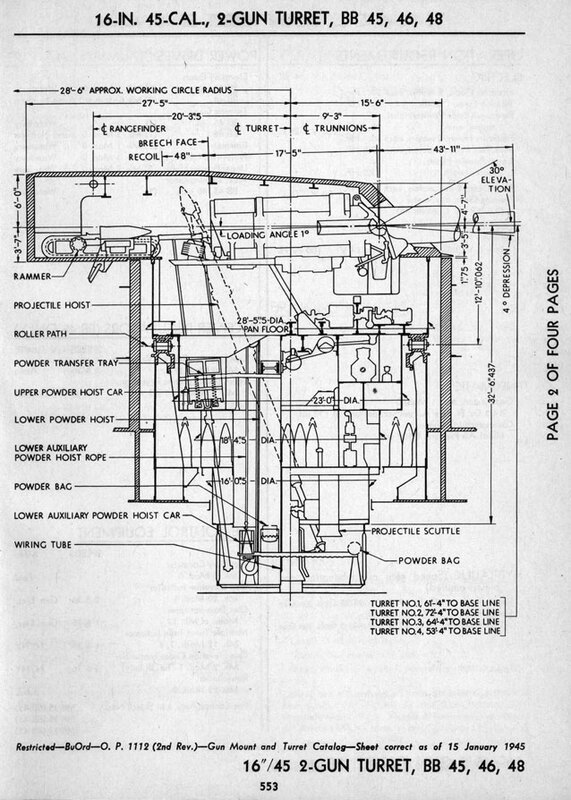 (1,016 kg) AP Mark 5, which was a heavier projectile with better armor piercing capability than the 2,110 lbs. (957.1 kg) AP Mark 3 that was originally issued to the Colorado's and the Mark 1 gun.